After reading Andy's take on Early Access survival game The Long Dark, I wanted to crash land in Canada, too—so I recorded the video above while I was at it. Without a story mode or crafting yet, I just tried to stay alive long enough to enjoy the intrinsic reward of exploring the beautiful, uncaring wild. 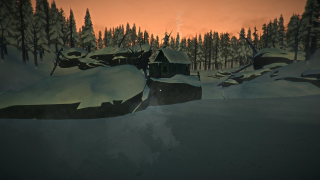 I like that The Long Dark pits me against nature and nothing else, and considering I was trying not to become a frozen brick of flesh, I found the experience surprisingly relaxing. I was slightly disappointed by the way the design gives up fidelity to encourage exploration: I need to search for a can opener rather than being allowed to use a knife to open cans, for instance, and the fresh snow is mysteriously toxic and needs to be purified. I used to eat snow all the time as a kid! I recognize, however, that giving me every contextual action I could ever want doesn't necessarily translate to challenging game design. Still, it's currently a bit of a scavenger hunt, and I hope that when crafting is added I can struggle to build a stable life or seek rescue—any kind of goal greater than finding the next frozen corpse to loot for energy bars. I suspect the story mode will also bring me back to Canada, but until then, it's a lovely place for a hike.